I really love subscription boxes. I love getting little packages every month in the mail full of exciting new goodies that I get to try out. However, I’m not a huge fan of the price tag that comes with my monthly box and I do find more often than not that I don’t like a lot of the products that are in my box. It’s hard for a company to always tailor every box to fit each individual’s specific tastes and preferences. Recently, both my sister and I cancelled a favorite subscription box of ours for that exact reason. Too expensive and not enough of the things we like! Then, I had an idea. Why don’t we create a subscription box for each other?! We know each other so well that the products would always be to the other’s tastes and creating one box for the other person every other month would bring down the hefty subscription box price tag. 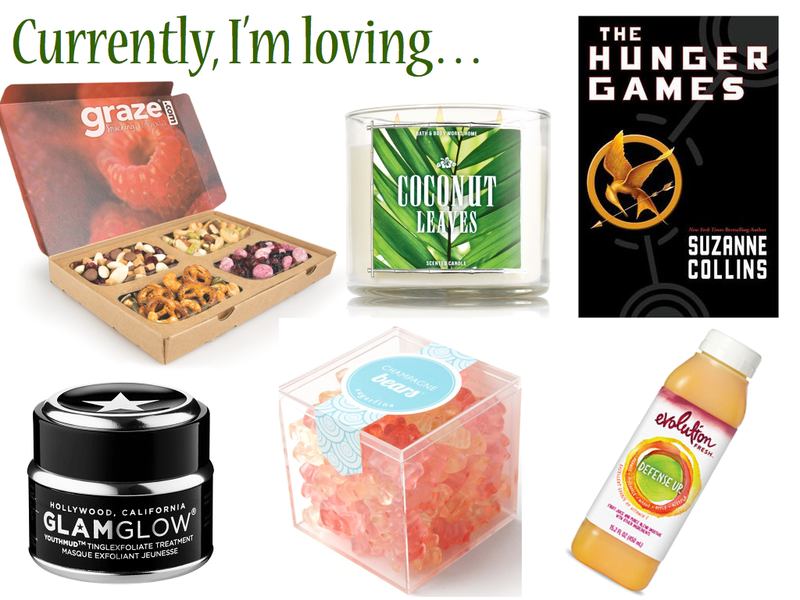 I put together the first box under the theme Romance & Relaxation for the upcoming Valentine’s Day holiday! I had so much fun shopping around for little products and knick knacks that I knew my sister would absolutely adore and I was totally right. She already has that little red Valentine’s mailbox sitting on her desk at work. I really can’t wait to see what she comes up with for the month of April! Progress for week 1 of the Get Up And Go campaign with Staples for American Heart Month. I have successfully run 1.25 miles! Now, I realize that this may not be a lot for some people, but I have not run a single mile since my Freshman year of high school. Embarrassingly enough, it still took a whole lot out of me to even get to that 1 mile marker. Thankfully my sister, who went running with me and runs a few miles almost daily herself, kept me motivated to hit that marker and work to go a little further. I have been loving the little tech gadgets that Staples sent me to aid me to #GetOutAndGo this month. I have been especially obsessed with my Fitbit for the all day everyday. Now while I can’t be running 24/7, I love seeing the steps tick up on my Fitbit, encouraging me to take that extra long walk to lunch or to make that extra trip around the block to get some fresh air. Last week, I took over 59,000 steps and I’m sure I stepped more because I could see my progress whenever I wanted. I can’t wait to see if I can beat my record, both in steps and in running next week! Graze – I have been absolutely loving Graze box lately. It’s a weekly, bi-weekly or monthly subscription snack box that has a crazy amount of snacking options. I find that they are the perfect mid-day pick me up in my office and with so many crazy combinations, I love opening up those boxes. Glam Glow – I have had a whole lot of stress on my plate lately. This has led to a major face freakout that led to more stressing out, which led to more face freakout and the cycle continues. I broke out this mask and I am so happy I did. This mask did an amazing job of reducing the severity of my flare-ups and smoothing out the bumps on my face after just one use so I really can’t wait to see what this can do after a couple of uses. Coconut Leaves – So I know it’s still winter, but I have been dreaming of summer sun and one smell that totally makes me think of summer and vacation is the smell of coconut. This candle seriously just brings up memories of sunscreen, sand and gorgeous waters. Summer and sun, please get here soon! Champagne Bears – Valentine’s day is almost here and, in preparation, I bought a WHOLE bunch of candy including the incredibly delicious Champagne Bears from Sugarfina. Imported from Germany and infused with Brute and Rosé champagne, these teeny bears are super tasty and totally Valentine’s Day present appropriate. The Hunger Games – After finishing the entire Divergent series, it only seemed appropriate to immediately pick up the entire Hunger Games series. I just started Catching Fire, which means I have totally been speed reading and loving the series. It feels so great to find another series to totally jump into. Defense-Up – Lately, it seems like everyone around me is getting sick so I have been trying really hard to boost my health and immunity. These Evolution Fresh juices have really been doing the trick. They give me such a great boost of energy and pack a ton of vitamin and fruit juice punch in them. Seriously, I’m pretty sure it’s my new addiction. I’m hoping a couple juices a day will keep the bad colds away! Do you buy your boyfriend a present for Valentine’s Day? I used to think it was a holiday for just the girls, but with my boyfriend Jean-Pierre, I just get so excited to pick out presents for him. I spent a good bit of time trying to pick out a few items to try and show him how much he means to me. 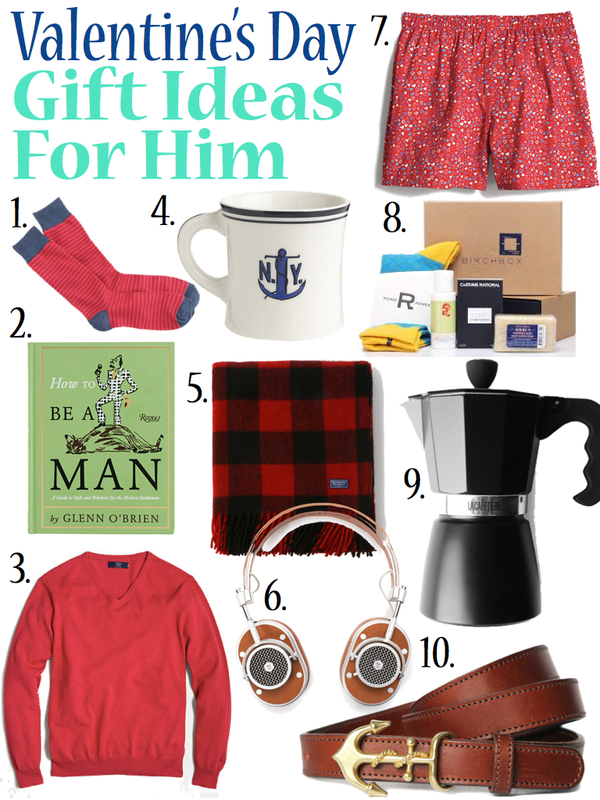 Here are some of the gift ideas I found that I thought were just too cute! 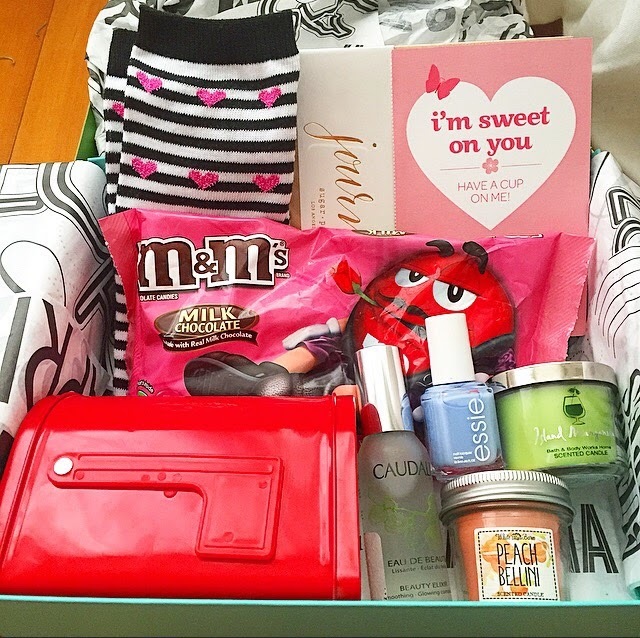 Are you getting your guy a Valentine’s Day gift? Share with me in the comments! low key evening in, you’ll be prepared and holiday appropriate with these adorable outfits. I’ll probably be wearing something a little more low key for a dinner made at home, but for any dinner out, Valentine up your outfit with a touch of pink or red! What kind of outfit do you have plan for Valentine’s Day? There’s a big rain storm headed to the bay. I decided to get prepared with the perfect outfit to wear on a rainy day. 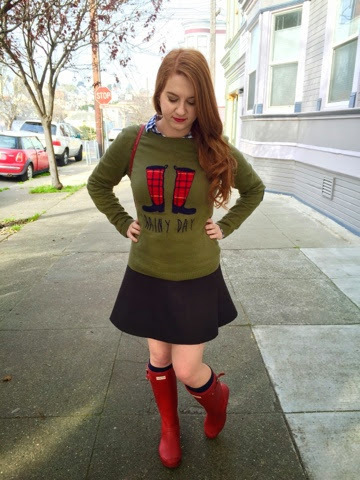 I love, love, love this sweater from Talbot’s. 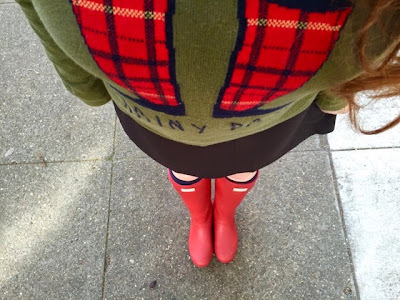 It’s super comfy and I love the little elbow patches and little red rain boots. Since I still need to be somewhat dressy for work, I paired the sweater with a gingham button down from J.Crew and a J.Crew Factory fluted skirt. 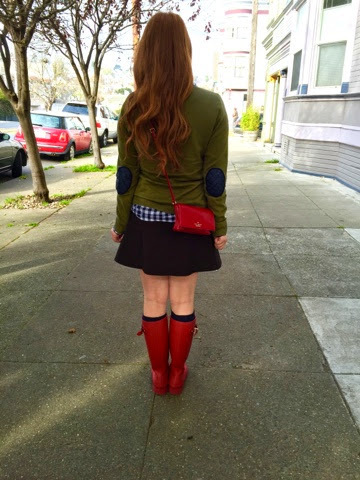 I own the fluted skirt in every color since it pairs so well with SO many of my outfits. I’m definitely prepared for a rainy day! These hunter packable boots are super amazing when it comes to rainstorms and big puddles! 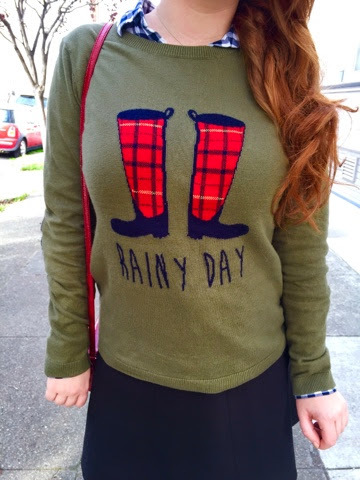 Do you have a favorite Rainy Day outfit? Share with me in the comments! I can’t believe it’s already February! The first month of the year flew by way too fast. It’s okay though because I adore the month of February and its Valentine’s Day celebrations. Valentine’s Day when I was single involved one of my best guy friends overnighting me a dozen cupcakes from my favorite spot, Georgetown Cupcake and my mom sending me a Valentine’s day card with a frilly red pair of VS undies. I loved it. Being with my favorite guy, it usually means flowers and candy and love, which I also quite enjoy. While Valentine’s Day can be meant for those who are in love, it can also be a good moment to love yourself. Whether you are paired up or happily solo, I think it can be the perfect time to spoil yourself or your friends with a little little something special. 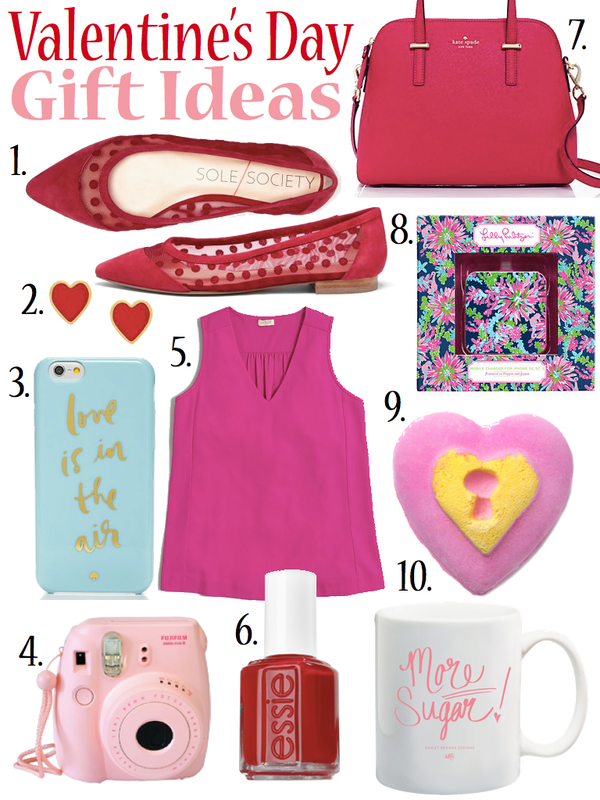 What would you be excited to get this Valentine’s Day? I love going through my skincare routine in the morning. It feels like it’s my pre-coffee wake up that jump starts the day. My routine has definitely changed over the years, especially as my acne continue to have flare-ups way past my teenage years and I think I finally found one that works for both my acne prone and somewhat sensitive skin. When I wake up, I immediately reach for my Burts Bees lip balm. I love the minty scent that does a good job of masking that morning breath if you have a significant other that you’d like to give a quick ‘good morning’ kiss. I have been loving using the Konjac Sponge every morning with my Boscia Purifying Cleansing Gel. I love how gentle this cleanser is on my skin and the sponge is the perfect daily exfoliator for my morning routine. After I wash my face, I use a cotton pad with Clinique Clarifying Lotion as a toner. It does a great job of toning without drying out my combination skin. After I’m washed and tone, I have been repeatedly reaching for the Fresh Lotus Youth Preserve Face Cream as my morning moisturizer. It is the perfect moisturizer that balances out my combo skin plus anti aging is always a bonus! 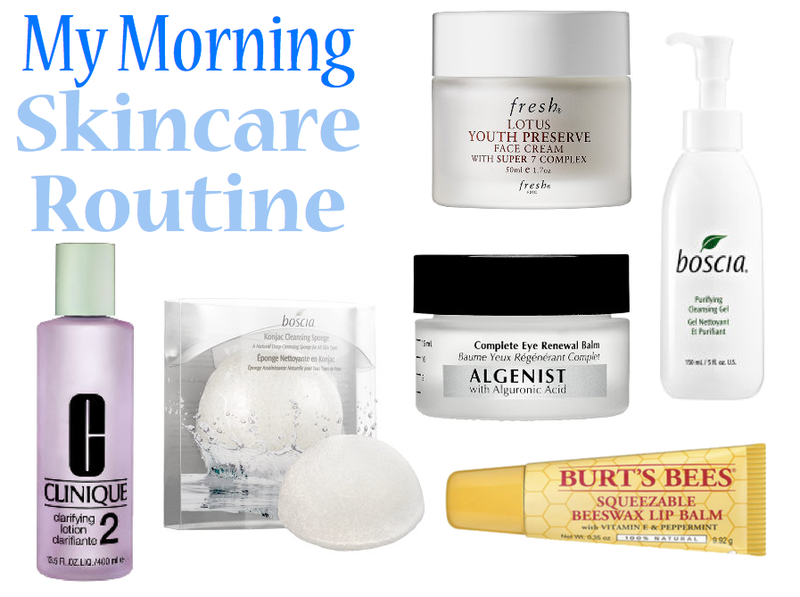 What are your go to products in your morning skincare routine? Most people think of hearts in the month of February as symbols of Valentine’s Day and visuals of romantic love, but February is also American Heart Month. 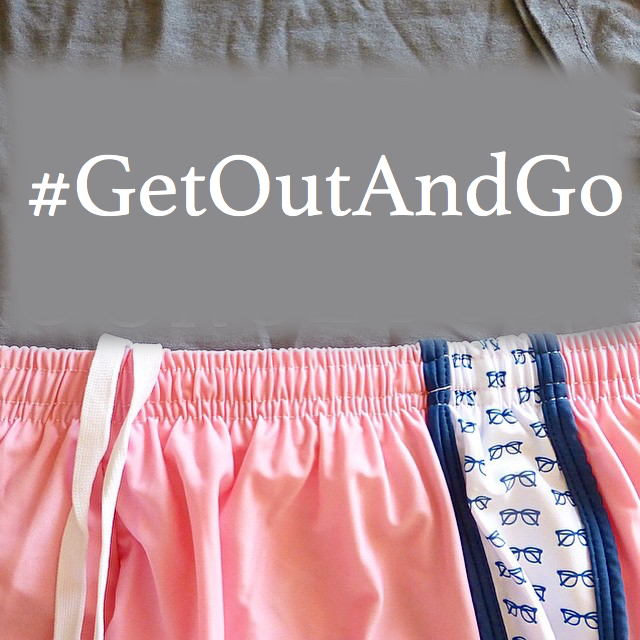 I’ve teamed up with Staples to raise awareness and to challenge myself with the #GetOutAndGo campaign to show my own heart some much needed love. Some great ways to reduce your risk for heart disease are a healthy diet, continuous exercise and regular checkups. I realized lately that I really need to work on pushing myself in the exercise and healthy eating department. The Get Up And Go campaign is all about pushing you outside your comfort zone, getting your heart rate up and getting into healthy habits that will pave the way to living with a healthy heart. A big challenge that I would love to take on throughout the month of February would be running. I love the idea of running, but I’m not a huge fan of the reality. 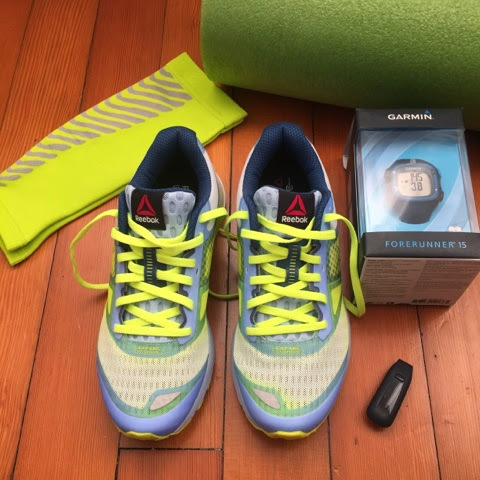 I haven’t been able to push myself past the breathlessness that seems to always be associated with attempting to make it past that first mile. I am determined to work through that breathlessness and push myself to run a 5k by the end of the month. Now, that may not seem like a lot to some, but it is a lot to someone who has not run a full mile since high school. I will be keeping you updated on my progress using the fun tech gadgets that Staples sent along including the handy dandy and oh so adorable fit bit. At the end of the month, you’ll even be given the chance to win a fit bit of your very own from Staples! As for now, I’ll be working towards living heart healthy.